Towards the end of the financial crisis of 2007-09, and especially once short-term yields approached the zero lower bound, the Federal Reserve undertook unprecedented measures to stem the economic decline. It developed a new arsenal of unconventional monetary policy tools – the purchase of long-term Treasury securities and other private assets such as mortgage-backed securities, and the use of forward guidance – to stimulate the economy. Given the large economic decline, an examination of the effectiveness of these different monetary measures is often limited to using model counterfactuals or term structure models (e.g. Chen et al. 2012, Bauer and Rudebusch 2014). We offer a different approach. 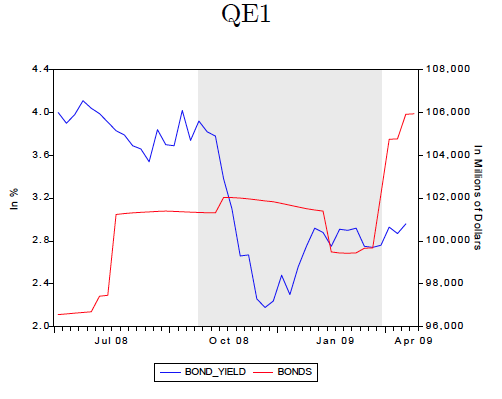 We use the Federal Reserve’s actions during another period of unprecedented economic contraction, in which the short-term rates were near the zero lower bound, as a lens to examine the QE1 operation. Specifically, we study the open-market operations conducted by the Fed over a four-month period in 1932, near the nadir of the Great Depression. During the previous three banking panics, since the autumn of 1930, the Federal Reserve had followed a passive policy stance. 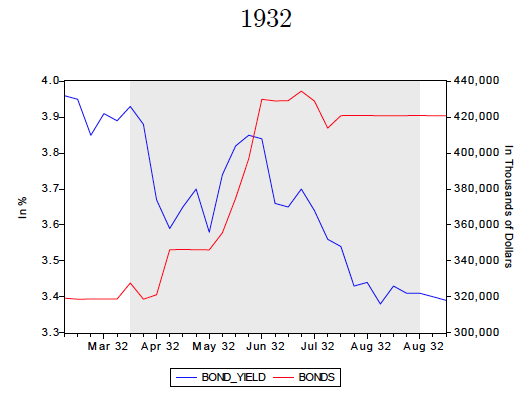 However, in the face of enormous Congressional pressure, the Fed relented, and between April and August 1932 undertook large scale purchases of US Treasury securities. It bought $1 billion dollars of medium- and long-term securities ($16 billion in current prices, or 2% of 1932 GNP). As a proportion of GDP, these purchases were comparable to the long-term Treasury purchases undertaken during QE1. There were many similarities between the environments of the two operations (see Figures 1 and 2, where we compare holdings of Treasury securities by the Fed and corresponding yields in the two periods). However, there were also significant differences, especially the facts that the US was on the gold standard, and that no announcements were made by the Fed about its policy actions. These we account for in our comparative study. In the absence of Federal Reserve communications of its actions during this period, we construct a narrative record of the operation. Using the record, we analyse the effects of these purchases on the relevant yields in the economy around the significant dates of the operation. 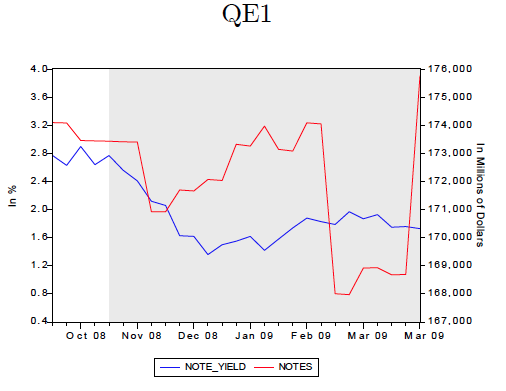 We then compare these results to the effects on yields of similar assets in the 2008-2009 QE1 operation. Finally, we implement a DSGE model with segmented markets to estimate the effects of the operation on the real economy. We use the model to ask whether the impact of the purchases could have been amplified had the Fed used forward guidance as under QE1, and allowed its purchases to last longer. The narrative record, constructed from the New York Times from January to August 1932, illustrates that although the Fed operation was not formally announced, financial markets were not unaware of it. Starting in February 1932, on the 17th and 28th of the month, the Times conjectured that following the Glass-Steagall bill, the Fed may increase its holdings of “governments”. In March 1932, the Times used the weekly statements of the Federal Reserve to conclude that the open-market operations used to expand credit were being pursued with “increased vigour” (11 March 1932). On 8 April of the same year, the rise in the Reserve System’s holdings of US securities was found to have been close to $25 million per week, since the end of February 1932. The ‘easy-money’ policy of the Fed was noted to have resulted, on April 13, in “a marked reduction in member bank borrowings and a relaxation of bank credit so considerable as to cause a drop by 1-1/3% in open market bill rates…”. On 15 April 1932, the Times reported that there was an increase of $100 million in the Fed’s holdings of US Treasury securities. One week later, the rise in loans and investments, which had been falling, were also noted. Over May and June 1932, the Times continued to note the increases in the Fed’s purchases, and that “the Federal Reserve is engaged in the most determined effort to bring about a rise in the price level ever undertaken by any central bank” (3 May). However, by July, the easy-money policy was perceived to be coming to an end, following the adjournment of the Congress. On August 19, 1932, the purchases were considered to have come to an end. In order to examine the effects of these ‘announcements’ on Treasury yields, we construct daily yields reported for US Treasury bills, notes, and bonds in the New York Times and the Wall Street Journal. 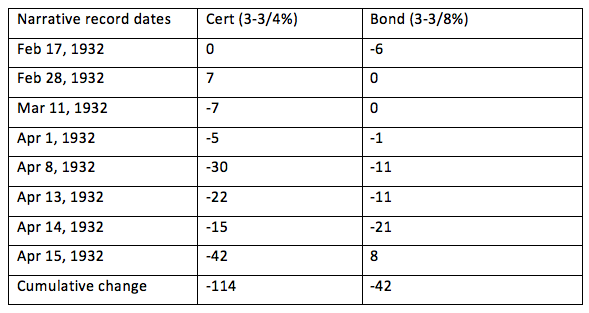 Table 1 shows the changes in these yields. For Treasury Certificates and Notes, the cumulative decline in yields ranges from 79 to 114 basis points. For Treasury bonds, the cumulative decline in yields ranges from 19 to 42 basis points. For all securities, the majority of the changes in yields are concentrated around the April dates. We also investigate whether there was a change in corporate bond prices (the 40-Bond prices reported by the Wall Street Journal, and railroad bonds) around the dates identified from the narrative record. Between 13 and 16 April, the cumulative change in the 40-Bond price shows an increase of 2.74 points, and railroad bond prices increased by 0.63 points. These changes suggest that reports of the Federal Reserve’s purchase operation influenced private investment decisions. Our event study suggests that the Fed’s operations had a significant effect on the yields in the economy, both for government and private securities. In order to further examine the effects of these purchases on the economy, and to illustrate whether the purchase operations could have been aided by the issuance of forward-guidance style communications from the Fed, we use a DSGE model with segmented financial markets. In our view, this is a plausible way to model the financial markets of the Depression era, since several features of the data suggest significant segmentation in these markets. The modal denominations of Liberty Bonds were $1000, which was very large relative to per capita income. Non-farm households held very little debt (short- or long-term), which was held largely by the finance sector. These households also had much smaller holdings of bonds relative to the finance sector, but they were more heavily invested in stocks. This suggests that a large percentage of the long-term debt was bought, and held, by wealthy investors. In our model, therefore, the households are modelled as paying a transaction cost to hold the long-term bond, while the institutional investors have no such costs. These wealthier investors are assumed to restrict their holdings to long-term bonds only. Using data from the 1920s and early 1930s, we estimate that financial market segmentation was approximately 20% larger during this period, relative to the markets in 2008-09 (the period corresponding to QE1). This implies that when the Fed purchased medium- and long-term debt, the risk premium on holding these long-term assets declined, and investors were much more restricted in arbitraging away the resulting difference in yields. 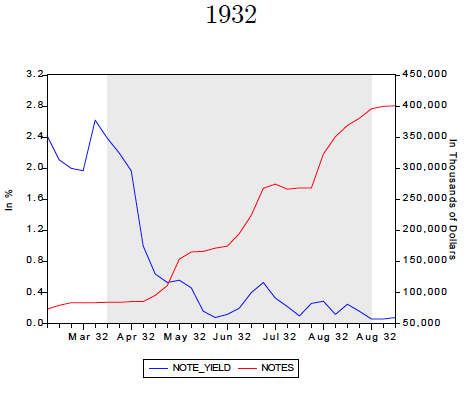 Although the 1932 policy – as Milton Friedman and Anna Schwartz (1963) first argued in their monumental book, A Monetary History of the United States 1867 to 1960 – boosted output and inflation, we find that had the Fed announced the operation in advance, and carried it out for a full year (instead of a quarter), the Great Depression could have been attenuated considerably earlier. Bauer, M, and G D Rudebusch (2014), "The Signaling Channel for Federal Reserve Bond Purchases", International Journal of Central Banking, 10 (3), 233-289. Bordo, M and A Sinha (2016), “A Lesson from the Great Depression that the Fed Might have Learned: A Comparison of the 1932 Open Market Purchases with Quantitative Easing”, NBER Working Paper No. 22581. Chen, H, V Cúrdia, and A Ferrero (2012), "The Macroeconomic Effects of Large-Scale Asset Purchase Program," Economic Journal, 122 (564), F289-F315. Friedman, M, and A J Schwartz (1963), A Monetary History of the United States: 1867 to 1960, Princeton University Press.